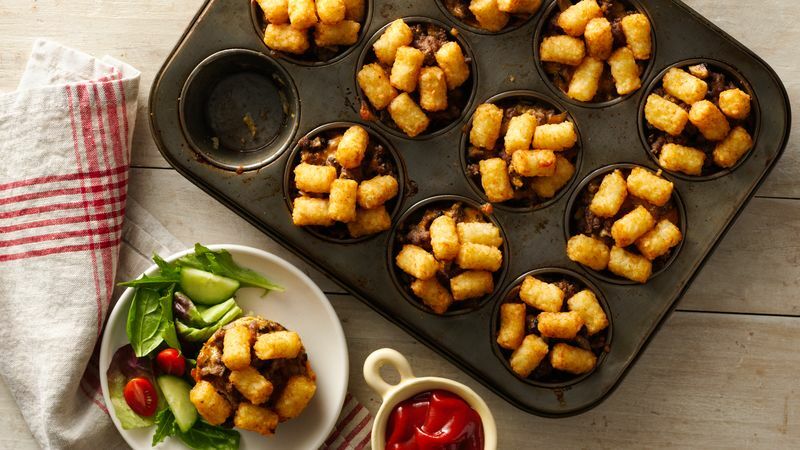 Place 6 frozen mini Tater Tots™ in each muffin cup; bake 20 minutes. Remove from oven; cool 5 minutes. 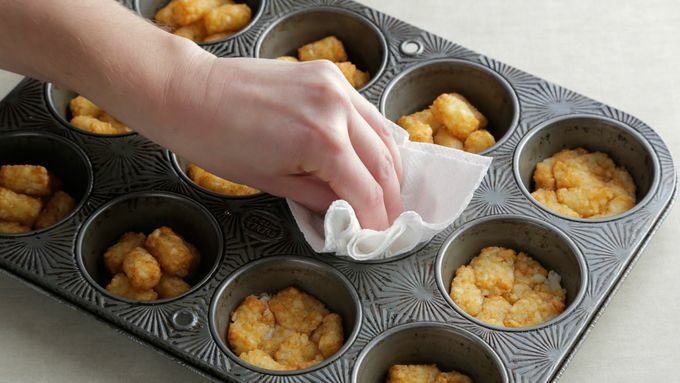 Using 2 paper towels, press Tater Tots™ into cups to create a base for the hot dish and to absorb excess oil. Meanwhile, in large bowl, mix milk and egg. 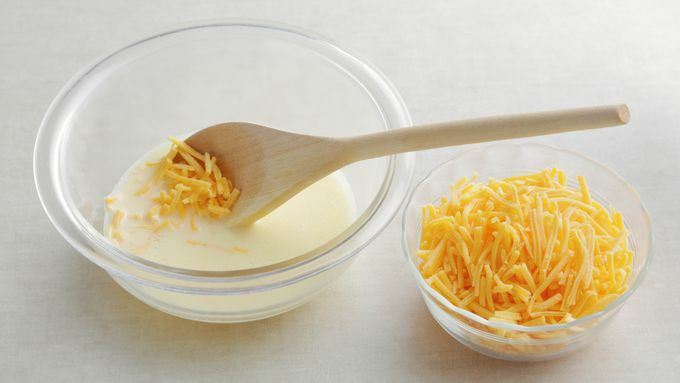 Stir in cheese; set aside. In 12-inch nonstick skillet, cook beef over medium-high heat 6 to 7 minutes, stirring frequently, until browned; drain. Remove from skillet; set aside. Wipe out skillet. 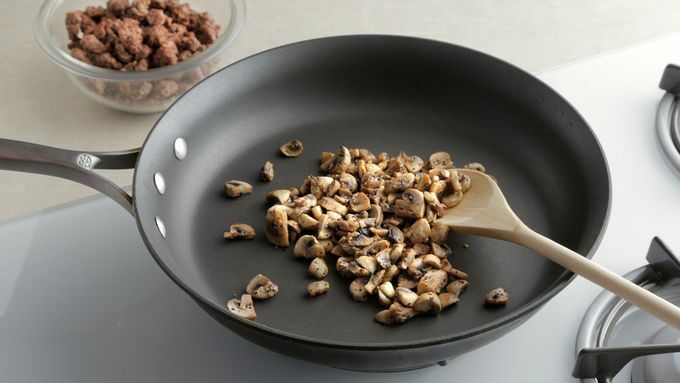 Add mushrooms and steak seasoning to dry skillet; cook over medium-high heat 6 to 7 minutes, stirring frequently, until browned. Remove from heat; cool 2 minutes. Add beef and mushrooms to cheese mixture. Pour evenly over potatoes in each muffin cup. Top each cup with 6 more Tater Tots™. 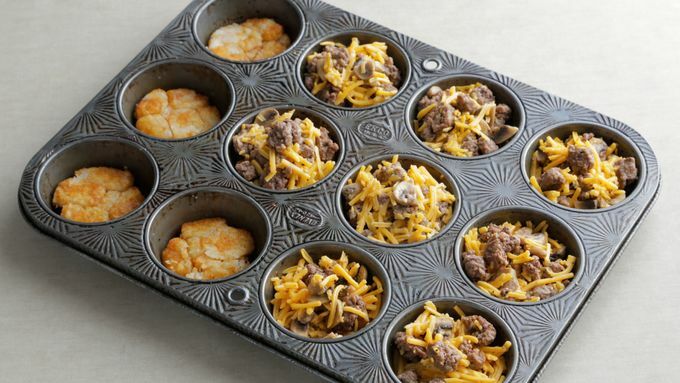 Place muffin tin on large rimmed cookie sheet. Bake 32 to 34 minutes or until mixture is set and Tater Tots™ are browned. Cool 15 minutes; run knife around each muffin cup, and lift out. In small bowl, mix ketchup and Sriracha sauce; serve with hot dish cups. 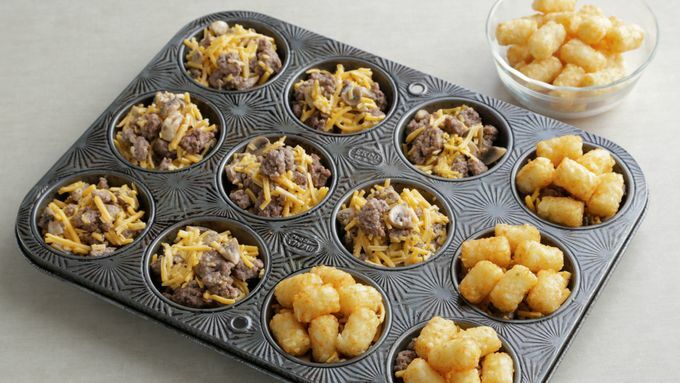 For easy removal, try to press Tater Tots™ directly onto beef mixture instead of letting them fall to the edges. Also, be sure to use the “mini” nuggets! To round out your Midwestern masterpiece, serve with green beans or a green salad. Be sure to allow cups to cool 15 minutes before removing from pan. They need time to set up so they can hold their shape.